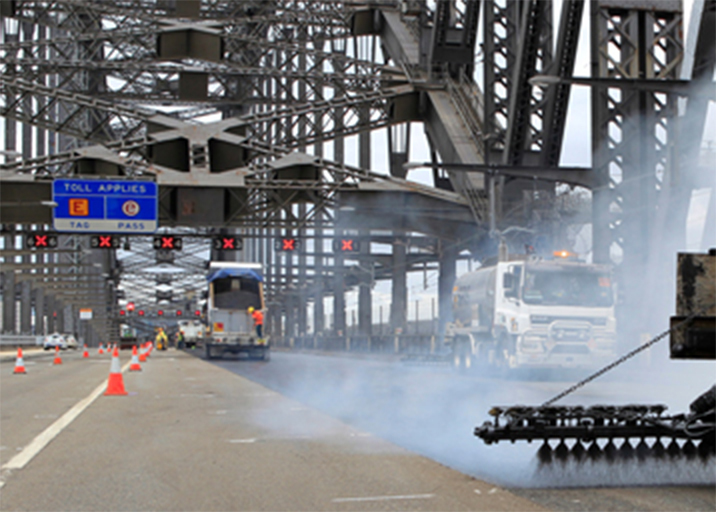 Sprayed sealing is a relatively low cost and efficient method of pavement surfacing, extensively used in maintaining the road net work, especially in rural areas, of Australia. It provides effective water proofing and aggregate retention when applied as a wearing surface. The sprayed sealing is also used for the reduction of crack reflection as a strain alleviating membrane (SAM) and as a strain absorbing interlayer (SAMI). Widely used for routine maintenance for lightly trafficked pavement where no major pavement deterioration is observed. Binders recommended are Class 170, Class 240 and Class 320 as specified in AS2008 or by the relevant State road authority. SAMIcutback grades recommended for the application are AMC 5, AMC 6 and AMC 7 and the recommended emulsion is SAMIflex CRS HR. Used for aggregate retention on heavily trafficked roads and the recommended polymer modified binders are Polyseal, SAMIseal S10E, SAMIseal S15E, SAMIseal S35E, SAMIseal S45R and SAMIseal PBD. The high residue emulsion equivalents recommended are SAMIflex E30 HR, SAMIflex E40 HR and Polyseal Emulsion. The application is used to withstand higher stresses imposed by heavy traffic volumes and consists of a double/ double seal. Suitable polymer modified binders for this application are Polyseal, SAMIseal S10E, SAMIseal S15E, SAMIseal S35E, SAMIseal S45R and SAMIseal PBD. Emulsion equivalents are SAMIflex E30 HR, SAMIflex E40 HR and Polyseal Emulsion. Generally a SAM treatment is recommended as a surface membrane layer to minimise reflection cracking and/or provide a more waterproof surfacing. It is also used for sealing minor surface cracks in pavements and concrete bridge deck surfaces. Typically the SAM is applied a single/single treatment or a double/double treatment. Suitable binders for this application are Polyseal, SAMIseal S10E, SAMIseal S15E, SAMIseal 20E, SAMIseal S35E, SAMIseal S45R and SAMIseal PBD. The recommended emulsions for the application are SAMIflex E50HR, SAMIflex E40HR and Polyseal emulsion. SAMI treatment is applied prior to an asphalt overlay to minimise reflection cracking into an asphalt layer and also used for providing a waterproof membrane under a porous asphalt overlay. It is applied as a single/single treatment but usually with higher rates of binder application. A Primer seal is an application to provide a temporary surfacing treatment that can extend the life of the existing seal until a final sprayed seal can be applied. It is usually applied as a single/single treatment but could be multiple treatments depending on the traffic. Primer binders could be either cutback bitumen or bitumen emulsions. SAMI recommends the modified emulsions; SAMIflex E30HR or SAMIflex E30LX for superior performance. SAMI also provides the cutback bitumen grades AMC2, AMC3 and AMC4 for this application.